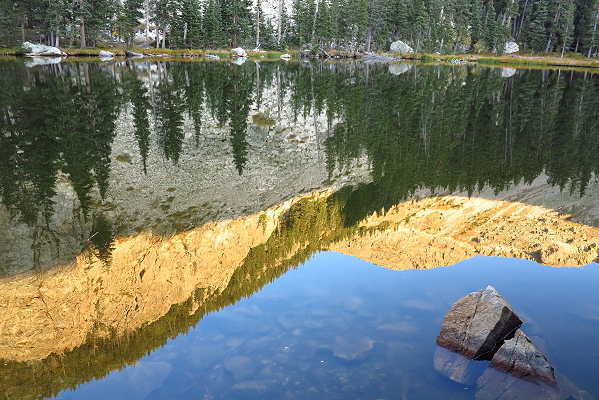 Nambe Lake Backpacking Trip – 1,800 foot elevation gain, about 3 ½ miles each way. 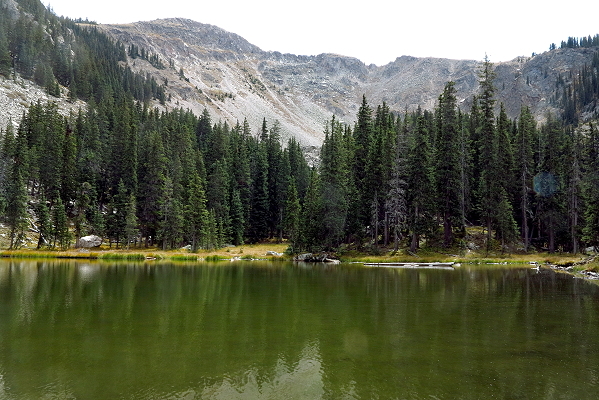 Friday, September 21, 2012 – We arrive at the Santa Fe ski basin and are on the trail to Nambe Lake a little after 3:00. 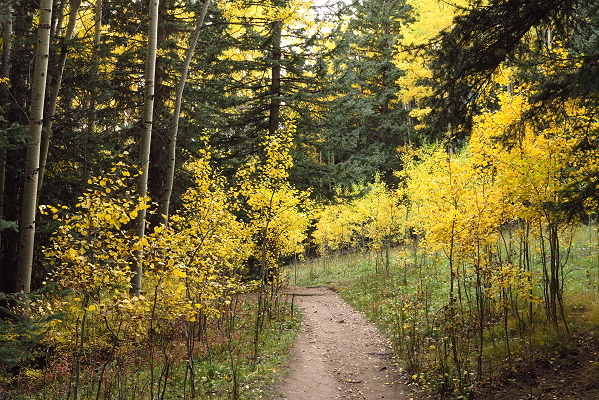 Uphill to the wilderness boundary – about 800 foot gain – then slightly downhill, descending 400 feet, to the Nambe Lake trail junction. At the junction, the trail climbs steeply upward over rocks and exposed tree roots, hardly a trail in many spots, steep and challenging. 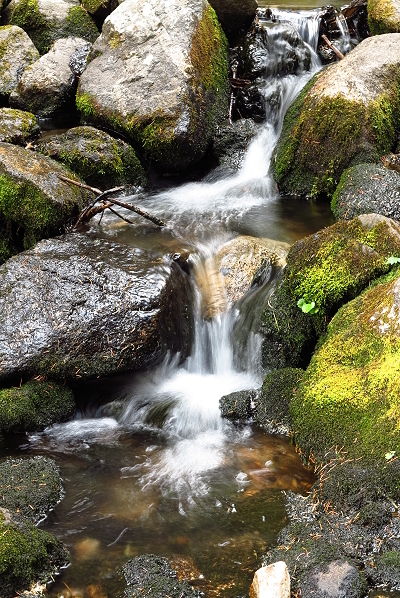 Alongside the trail, a wonderful little creek tumbles downhill over boulders, making little waterfalls here and there, quite magical in its descent. Being as late as it is, we don’t have time to stop for photos or even for the break that I am needing. 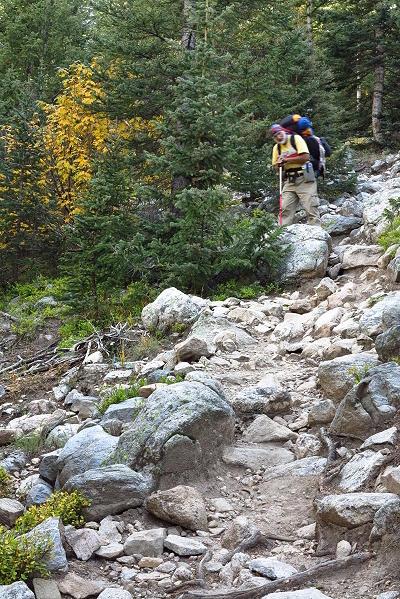 This steep uphill is challenging for me, especially with the pack being heavier – warmer clothes for the cooler temps. We finally, gratefully, reach Nambe Lake about 6:00 after 1,000 foot elevation gain. 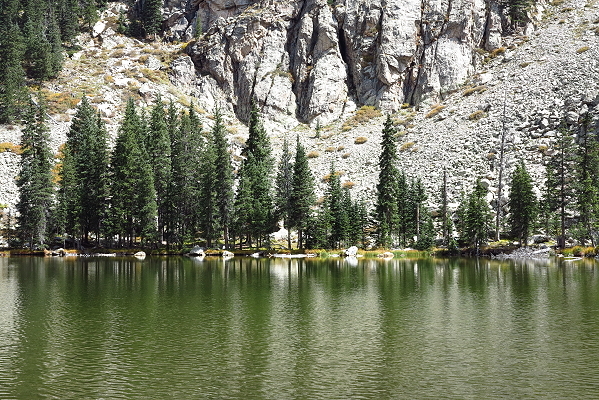 Nambe Lake sits in a mountain bowl with rock-faced cliffs on the east and south and with steep treed slopes on the north and west. Then we look for a campsite. We find one on a bench on the west side of the lake. The fire-ring is surrounded by fallen longs and we find a spot just barely big enough to set up the tent just outside the ring of logs. Clifford gets a little cook-fire going right away so we can heat water for tea. He is feeling a little dizzy and we figure having hot tea will be relaxing and refreshing. 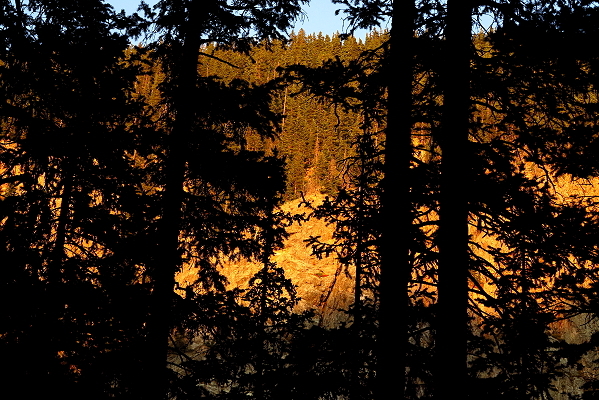 Just before the sun goes down, there is a wonderful golden color on the cliff-face to the east. I get a few photos before the color fades. We make raman for dinner with dried spinach, peas, and salmon added – much tastier and more nutritious than plain raman. After dinner and clean-up by lantern-light, we hang the food bag and then head to bed. I am sleeping in my bathrobe, warmer, but heavy to pack in. Woke up in the night with painful cramps in my thigh. Happened several times. Saturday, September 22, 2012 – Daylight and I wake up having no idea what time it is, so doze off and on several times before finally getting up. 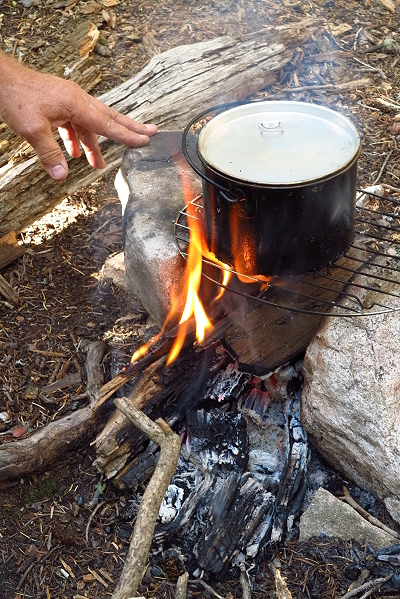 Gather some small twigs to start the cook fire. Clifford is soon up, so he takes the twigs and gets the little fire started. We heat water for hot drinks and have enough hot water left for our oatmeal for breakfast. 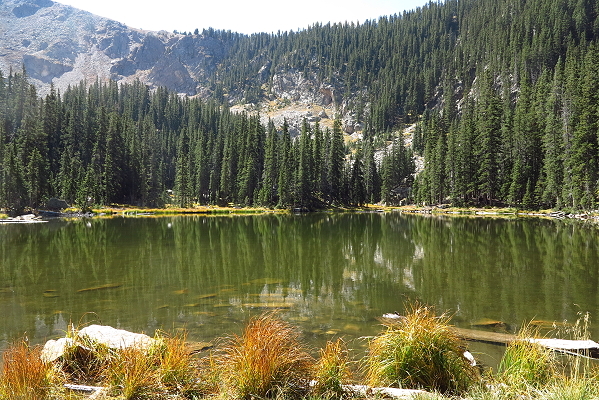 After breakfast, we hike around the lake. There is a really pretty campsite at the end of the lake, but someone was there when we arrived yesterday. They are gone now and we didn’t even hear them leave. This is where I’d like to camp if we make another trip up here. 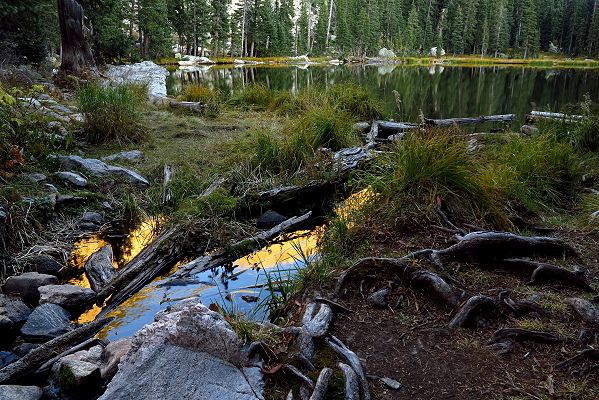 As we hike around this small lake, I take photos here and there of the reflections on the calm water and of the autumn colors. When we get back to camp we have hot tea, do crosswords puzzles, Clifford reads and I write in my small backpacking journal. While Clifford naps after lunch, I do some editing – about 50 small-print pages of the novel “Emperors and Exiles.” Along with taking photos of the lake, the editing keeps me busy until dinner. We go down to the lake outlet for more water as the sun is setting. The wind comes up, but we have a cheery campfire and a hot dinner. After dinner and cleanup, as soon as the fire burns down, we head to bed. A wonderful Autumn Equinox day. 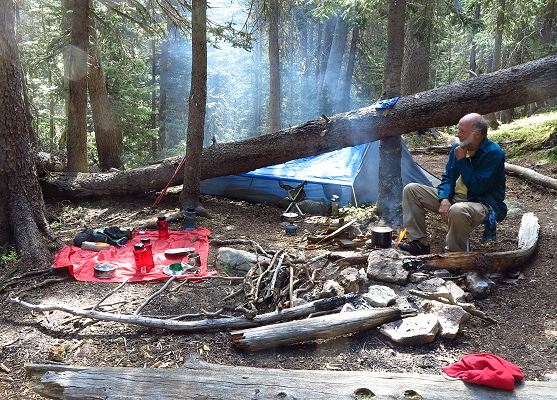 Slept better – warm in tent even though it is windy all night. 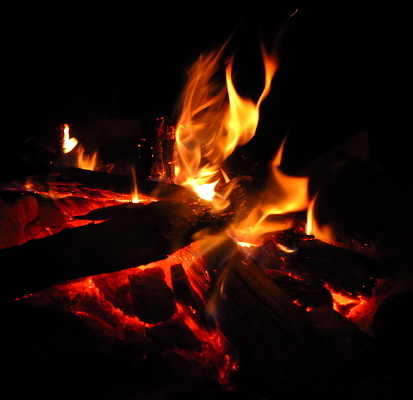 Sunday September 23, 2012 – I am up before Clifford and start collecting twigs to start a fire. He is up by time I get back from my wanderings. We get a fire started and heat water for hot chocolate. Blue sky is becoming obscured by hazy clouds. Still windy off and on. Oatmeal for breakfast and then wash up – head to toe for me after dishes are done. Start packing. Do another crossword puzzle and thought I would start reading the new Backpacker, but it is later than we thought, so we finish packing and head on down the trail. Steep going down, but a lot easier than the going up. Part way down, the women ahead of us have taken a wrong trail. We continue on a ways, but Clifford is concerned, so we take off our packs and he goes back to see if he can find out if they are okay. He isn’t gone very long, as he as figured what they had to do to get back onto the main path along the creek. It is no wonder hikers get lost up here every year; the trail just isn’t obvious much of the time. On down we go. Once we reach the junction, it is uphill to the boundary and then the last steep downhill to the ski basin, taking photos along the way. 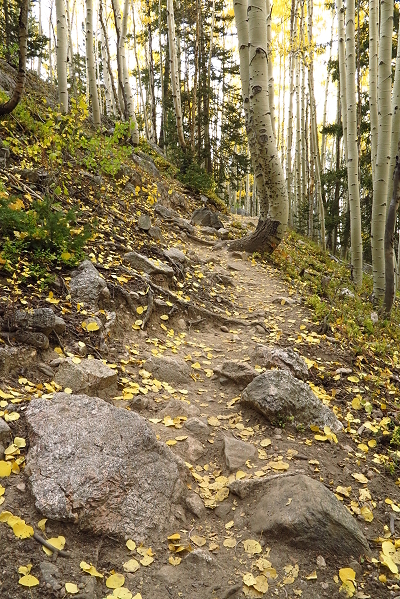 It is so pretty – I love the rocks and the golden-leaved aspen. Back in Santa Fe, we run a couple of errands and then Harry’s for dinner, sitting in the garden with all the strings of lights on. Very charming. So ends the successful outing to Nambe Lake.